The morning after you restore the third Skytree, a gruff old fellow will be by your front door. He introduces himself as Gus and he is looking for a good place to mine for some ore. He requests that you go find a mine for him. Rowan hints that there is one close by, up high on a cliff. Rowan will also give you the H. Sprite Whistle you can use to call him if you get stuck anywhere. Head into the barren land and hop over the stream to trigger the shovel tutorial with Rowan. Use the shovel to fill and dig the soil until you can reach the mine at the top of the cliff, then go inside to learn about mining from Rowan. You won't have a hammer to do any mining though. Return to talk to Gus and will give you 3 Material Stone to thank you for telling him about the nearby mine. He'll decide to move into town. Gus' Forge will be open Monday through Saturday from 8am to 6 pm. The next morning, a pink haired woman will be outside your farm house, complaining about how this location can't possibly be the Harvest Goddess' land. Just look at your own house! What a dump! She introduces herself as Melanie and then leaves to search for the Harvest Goddess Spring. The morning after meeting Melanie, Rowan will be upset about some weirdo who showed up. The oddball casually walks into your house to announce that an inventor extraordinaire has arrived! You try to tell Doc that you aren't a fellow inventor, but he is not convinced. He was passing by when he became inspired; so much so that he is going to set up a lab in town to get started working on his latest invention. Head into town to find that Doc has already set up a laboratory workshop just west of Gus' Forge. The inventor is happy that you've come to visit, as he is in need of 1 Material Stone and 3 Softwood Lumber. He is working on delicate experiments and can't leave the lab to collect the items himself. 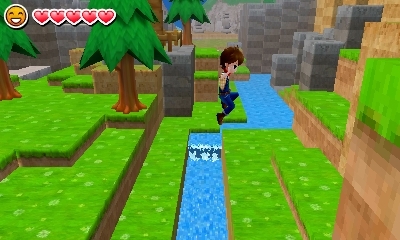 You don't have a way to collect lumber though, although you already have Material Stone thanks to Gus. Rowan suggests that the blacksmith might have an axe. Visit Gus at his house to ask him about an axe. He says he is too old to craft an axe for you and he only refines ores now. Melanie walks into the house and demands that Grampy Gus make you an axe. Gus continues to refuse, even if the request is from his granddaughter. He just can't make an axe that would be decent enough. Since Gus won't make the axe, Melanie offers to give you the axe that she made long ago; she made it, so she can do whatever she wants to do with it! Melanie then gives you her axe. As another morning appears, a strange lady is in front of your farm house. Rowan is naturally terrified again. The lady introduces herself as Tabitha, The World's Number One Witch. She is searching for a nerdy looking wizard. Tabitha must be referring to Gareth, who just happened to walk by. The witch demands that they start their magic duel, but Gareth brushes her off because he is busy today. He poofs away in a cloud of magic, with Tabitha following behind him in pursuit. You will need to find a wide space to place Doc's Barn insta-building in the barren land. After you have placed the Barn (placing a Coop does not count), the next morning walk out of your house to see a horse standing there! Some people appear who look to have been searching for the horse. Sofia explains that they lost this horse, but it seems to like you. Sofia introduces you to her sons, Gabriel and Michael. 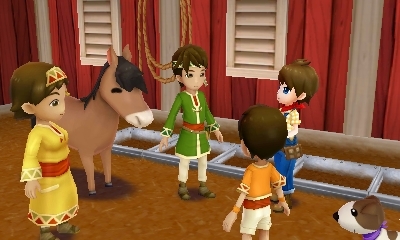 The horse starts to get upset, so Sofia asks if you have a place where the horse can relax and settle down. You let them borrow your new barn. The horse looks very comfortable inside your barn. Michael convinces his mom and brother to let you try riding the horse. The horse is so calm with you that Gabriel suggests they just give you the horse for free! You can then name your new pony friend (up to 10 characters). Gabriel will give you a brush, pitchfork, and Animal Feed. Sofia decides that even though they're nomads, they'd like to settle down in the village for a while. From then, Sofia's Herd House is open Monday through Saturday from 10am to 8pm. Her shop will be inside your animal barn and not at her house in the village. The next morning after the nomads move in, when you leave your house you will find two women standing outside. They were shocked to see that someone was living in the house! Sally introduces herself as an explorer, while her mom, Naomi, explains that she's here to write a news story about the reason why the land dried up. Besides, Sally is also here to catch some mythical little elves. They are going to be staying in town, so stop by if you hear anything she can use for a story lead. One evening you'll have a dream about Michael's dog, Max, becoming sick. Head to Sofia's house in the village to investigate. Max really is sick and Gabriel blames his brother for not taking better care of their dog. Even Sofia scolds Michael about being more responsible. Gabriel says that Max will feel better once he eats some nutritious dog food. Elise arrives and says she can make the required dog food if you bring her 2 Corn and 1 Black Bass. You can buy Corn Seeds from Sam. Black Bass is caught while fishing; check the large pond area where the third Skytree is located. 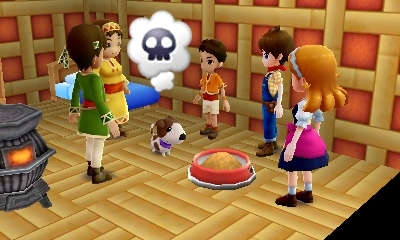 Walk into the inn with the ingredients in your bag to help Elise make the Deluxe Dog Food. Bring the dog food back to Max, but the dog won't eat it. Gabriel eats the dog food (whaa?) and says it tastes good, so he doesn't understand why Max won't eat. Elise suggests trying again using different ingredients. This time you'll try 2 Corn and 1 Perch. Grow some more Corn, and Perch is a common fish. Bring the ingredients to the inn again to whip up a batch of Select Dog Food. Take it back to Max but the dog still won't eat! Again Gabriel eats the dog food, and this time exclaims that it tastes better than the first attempt. Maybe Bastian has some advice? Return to the inn and talk with the chef. He asks if anyone has asked Max what he likes? Go back to Sofia's and talk directly to Michael. The boy says that his dog likes Cabbage, Mosquitofish, and Tomatoes as well as a specific food dish, which Michael gives to you. This time Elise wants you to collect 2 Cabbage, 3 Mosquitofish, and 1 Tomato. The seeds are at Sam's, and the fish are uncommon but can be caught in the stream. Bring everything back to the inn and this time even Michael helps to make Max's Favorite Dog Food. Back at the nomad tent, Michael still feels bad for letting Max become sick. Elise insists that because Michael made the food, he should be the one to feed it to the dog. Max finally eats the dog food! Gabriel eats the dog food too and while it isn't the best tasting food, Max must be associating the flavor with good memories. The dog food that Max wants to eat is the food made by Michael. The boy promises to do a better job caring for Max from now on. As you leave the tent, Rowan appeared to let you know that the power of caring has influenced the animals. This means the Harvest Goddess had recovered some more of her power! Head back to the spring to watch the goddess revive the fourth Skytree and restore Calvin, the harvest sprite of animals. Calvin can herd your animals from the barn to the pasture to graze. You can now hire two sprites at a time.